For the next few days backyard astronomers can see for themselves the long lost asteroid Hermes. October 31, 2003: It's dogma now: an asteroid hit Earth 65 million years ago and wiped out the dinosaurs. But in 1980 when scientists Walter and Luis Alvarez first suggested the idea to a gathering at the American Association for Advancement of Sciences, their listeners were skeptical. Asteroids hitting Earth? Wiping out species? It seemed incredible. Right: from "Dino Killer" by artist Don Davis. At that very moment, unknown to the audience, an asteroid named Hermes halfway between Mars and Jupiter was beginning a long plunge toward our planet. Six months later it would pass 300,000 miles from Earth's orbit, only a little more than the distance to the Moon. Rhetorically speaking, this would have made a great point in favor of the Alvarezes. Curiously, though, no one noticed the flyby. On Oct. 28, 1937, astronomer Karl Reinmuth of Heidelberg noticed an odd streak of light in a picture he had just taken of the night sky. About as bright as a 9th magnitude star, it was an asteroid, close to Earth and moving fast--so fast that he named it Hermes, the herald of Olympian gods. On Oct. 30, 1937, Hermes glided past Earth only twice as far away as the Moon, racing across the sky at a rate of 5 degrees per hour. Nowadays only meteors and Earth-orbiting satellites move faster. Plenty of asteroids were known in 1937, but most were plodding members of the asteroid belt far beyond Mars. Hermes was different. It visited the inner solar system. It crossed Earth's orbit. It proved that asteroids could come perilously close to our planet. And when they came, they came fast. Reinmuth observed Hermes for five days. Then, to make a long story short, he lost it. Hermes approaches Earth's orbit twice every 777 days. Usually our planet is far away when the orbit crossing happens, but in 1937, 1942, 1954, 1974 and 1986, Hermes came harrowingly close to Earth itself. We know about most of these encounters only because Lowell Observatory astronomer Brian Skiff re-discovered Hermes… on Oct. 15, 2003. Astronomers around the world have been tracking it carefully ever since. Orbit-specialists Steve Chesley and Paul Chodas of NASA's Jet Propulsion Laboratory (JPL) have used the new observations to trace Hermes' path backwards in time, and so they identified all the unnoticed flybys. "It's a little unnerving," says Chodas. "Hermes has sailed by Earth so many times and we didn't even know it." "Hermes' orbit is the most chaotic of all near-Earth asteroids," he adds. This is because the asteroid is so often tugged by Earth's gravity. Hermes has occasional close encounters with Venus, too. In 1954 the asteroid flew by both planets. "That was a real orbit scrambler," Chodas says. Frequent encounters with Earth and Venus make it hard to forecast Hermes' path much more than a century in advance. The good news is that "Hermes won't approach Earth any closer than about 0.02 AU within the next hundred years." We're safe for now. Below: The elliptical orbit of asteroid Hermes (red) brings it to the inner solar system every 777 days. Reinmuth first spotted Hermes approaching Earth from the direction of the asteroid belt. At first it was easy to see because the asteroid's sunlit side was facing Earth. Speedy Hermes soon crossed Earth's orbit, however, and began turning its night side toward us. Asteroids are nearly as dark as charcoal, and their night sides are very dim. By Nov. 3rd, six days after its discovery, the asteroid had faded from 9th to 21st magnitude, a factor of 60,000. "Hermes was also heading into the sun's glare, which only made matters worse," notes Chodas. Hermes literally vanished. No one seemed to care, not much. In 1937, World War II was about to begin in Europe, so people had a lot on their minds. Hermes failed to impress. Says Chodas: "Astronomers of the day were somewhat biased, perhaps. They had convinced themselves that collisions were too rare to consider. Hermes didn't change their opinion because catastrophism was not in vogue." It's in vogue now--largely because of comet Shoemaker-Levy 9 (SL9), an object discovered by people hunting for Hermes. 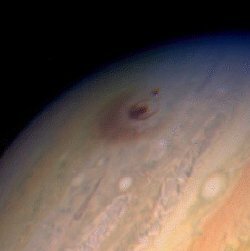 Found in 1993 by Gene and Carolyn Shoemaker and David Levy, SL9 hit Jupiter in July 1994 with much of the world watching on CNN. Long before the collision, SL9 had been torn apart by Jupiter's powerful tides. The largest fragments, coincidentally about the same size as asteroid Hermes, exploded with such force when they struck that dark clouds formed in Jupiter's atmosphere as large as Earth itself. A message from Jupiter: Catastrophes happen. "Gene always felt that Hermes should have done more to excite the world than it did at the time" recalls David Levy. "Indeed, he and his wife Carolyn were always hoping to find it." Shoemaker was a visionary who realized long before most others did that asteroids and comets posed an ongoing threat to Earth. In the late 1970's he and a few colleagues began to hunt for near-Earth objects using an 18-inch telescope at the Palomar Observatory. For a long while it was the only such survey on Earth. 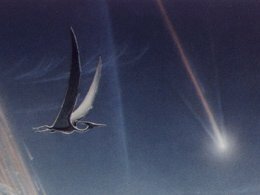 They discovered dozens of asteroids and comets, including SL9--but not Hermes. "When Hermes passed by Earth in 1986 (an encounter identified post-facto by Chodas) it should have been an easy target for us," notes Levy. "But the telescope was down for repairs." Shoemaker died in 1997 not knowing how close he came. Now backyard astronomers around the world can do something Gene Shoemaker never did--see Hermes. Hermes is fast approaching Earth, and on Nov. 4th it will pass by our planet 18 times farther away than the moon. Already the asteroid is about as bright as a 13th magnitude star--an easy target for 8-inch telescopes equipped with CCD cameras. Where should you point your 'scope? Consult the JPL Ephemeris for details. In recent days a group of NASA-supported astronomers led by Jean-Luc Margot of UCLA have pinged the asteroid with radar pulses from the giant Arecibo antenna in Puerto Rico. Hermes, it turns out, is a double asteroid--two space rocks orbiting one another, each about 400 meters across. No one knows how Hermes came to be this way. Margot and colleagues hope to learn more when the asteroid passes by on Nov. 4th as they continue their observations using both Arecibo and NASA's Goldstone radar. Now that Hermes has our attention, it might teach us a few things after all. Asteroid Hermes Ephemeris -- (JPL) use this online tool to figure out where Hermes will be in the sky this week. See also the 3D orbit of Hermes. 1937 UB -- (NeoDys) Hermes is also known as 1937 UB. Check this site more more information about its orbit and close encounters with planets.